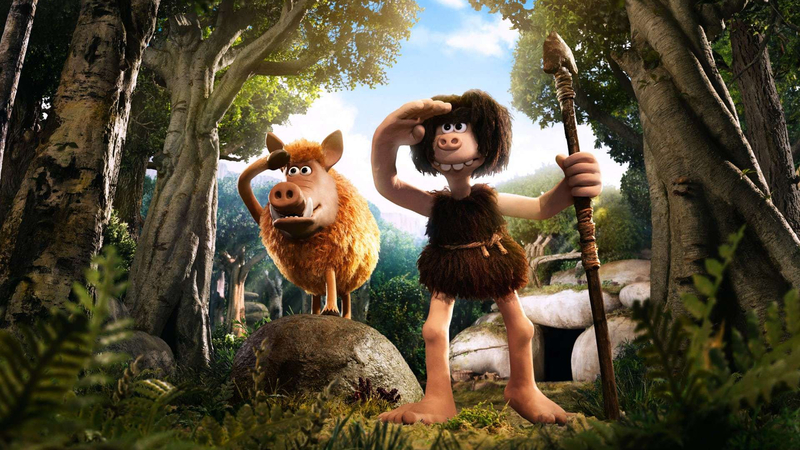 Recalling the fantasy prehistoric romps of Hammer – light on historical accuracy, heavy on thrills – British animation institution Aardman return this year with Early Man, a bright if narratively bland caveman caper that effectively functions as Escape to Victory for the under-10s. Eddie Redmayne lends his voice to Dug, a nice-but-dim neanderthal leading an idyllic existence in a leafy meteor crater. Passing his shortened lifespan hunting rabbits with his blundering tribe (voiced by Timothy Spall, Richard Ayoade and Selina Griffiths, among others), he dreams of stalking mammoths like his primeval ancestors. However, the tribe’s very existence is jeopardised by the invasion of a bronze age superpower, who threaten to enslave their slack-jawed subordinates unless they can defeat them at their sacred game – something called “football”. Presumably planned for release in a FIFA world cup year – the technologically-advanced invaders’ queen, voiced by the wonderful Miriam Margolyes, is herself called ‘Oofeefa’ – it’s somewhat disappointing to see Aardman and founder Nick Parks falling back on such hackneyed plotting, even if Early Man does seem more pitched at the Shaun of the Sheep flock than those that heartily enjoyed the riotous The Pirates! In an Adventure with Scientists!. Thankfully, some typically rich voice-acting and a plethora of visual gags help to gloss over a number of uncharacteristic stumbles. In the age of Brexit – and given the strides made by Paddington and its sequel to promote diversity and tolerance in 21st century Britain – it’s somewhat jarring to see a children’s film taking aim at cultured foreigners (whose names and accents drift languidly between Celtic, Gallic and Germanic) for their pomposity and vanity, even if it is through the sphere of team sport. There are, of course, exceptions. The heroine of the piece Goona (the first Gooner? ), voiced by Game of Thrones star Maisie Williams, is a Celt who gives as good as she gets – although within an established matriarchy where women are already allowed to play football alongside men, such a character feels surprisingly redundant. Understandably synonymous with the Aardman brand, this latest offering does suggest that it may be time for Nick Parks to hand over the direction of his beautifully-crafted creations to younger, fresher minds, bringing the studio’s storytelling into the 21st century just as they have done with their trademark approach to stop-motion animation that still peaked with Wallace and Gromit. Jokes about extinction abound in Early Man, but it is now perhaps time for Parks and co. to evolve before they’re left behind by the likes of Pixar, Laika et al.